Ten-Fathom Bar is probably one of the most dramatic dives in the Florida Keys. The dive site, located at 24'26.402N 081'52.669W, is the site of a sea wall underwater which features a fantastic drop-off. The depth range is huge—the shallower areas are around 25 feet deep while the seafloor below the wall is 130 feet down. There's a strong current around the drop-off which may give some novice divers some trouble. The strong current is the result of the Gulf Stream, which also creates excellent visibility through most of the year. The clarity of the water makes this site as appealing as the dramatic underwater scenery. 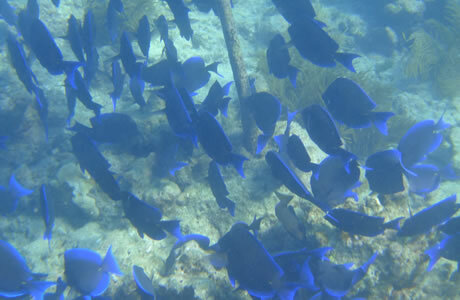 One exciting thing about Ten-Fathom Bar is that at different depths you can view different species of marine life. The coral on the sea floor is quite different from the coral in the shallower sections of the dive area. You'll also get to see some giant barrel sponges which may be larger than you are as well as uncommon species of black coral. Along with the fish that are common throughout these waters, you may also get a close encounter with a Manta Ray. Many stingrays sleep on the seafloor 130 feet down. You'll also probably see spiny lobster, porcupine fish, and many colourful tropical species of fish. Fennel Ridge is a noteworthy feature in the southern part of the reef which is located 60 feet underwater. Here you'll be able to pick out the remains of a coral-encrusted telegraph communication cable. This is a very popular destination and can be one of the more crowded dive sites in the area, but it's also very spacious with a lot to see and explore. With the clear water conditions you'll want to make sure you have a waterproof camera handy.